Glamping is a portmanteau of the words “Glamorous” and “Camping”, and was invented to describe a traditional nature camping experience combined with hotel-like luxuries, like proper beds, electricity, and possibly even hot showers within your tent. The term “Glamping” was first used in 2005 in the United Kingdom, but the concept of Glamping reaches back as far as the 16th century, when e.g. the Ottomans transported luxurious tents throughout their military missions, or when the Scottish Duke of Atholl welcomed King Henry V and his mother to his estate in the Highlands. These days, glamping has turned into a buzzword for travelers, as escaping onto a “campground” with your family, friends or your partner (and even for your honeymoon), while not being forced to sacrifice on any comfort, is an experience many travelers want to indulge in. 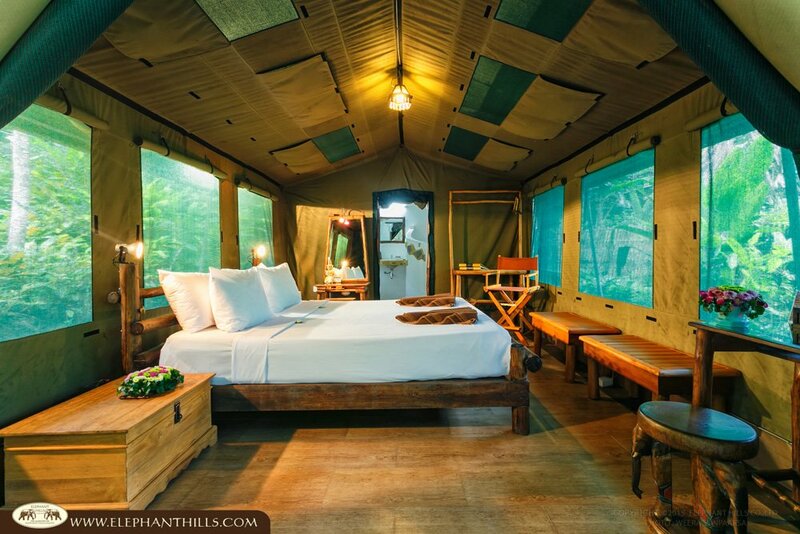 The original holiday glamping became popular in Northern and Southern Africa around the 1920’s, when wealthy American and British travelers set out to explore new countries, but weren’t willing to settle for the common local living standards – back then being very basic. Luckily, today Glamping is not just for the rich and famous anymore. 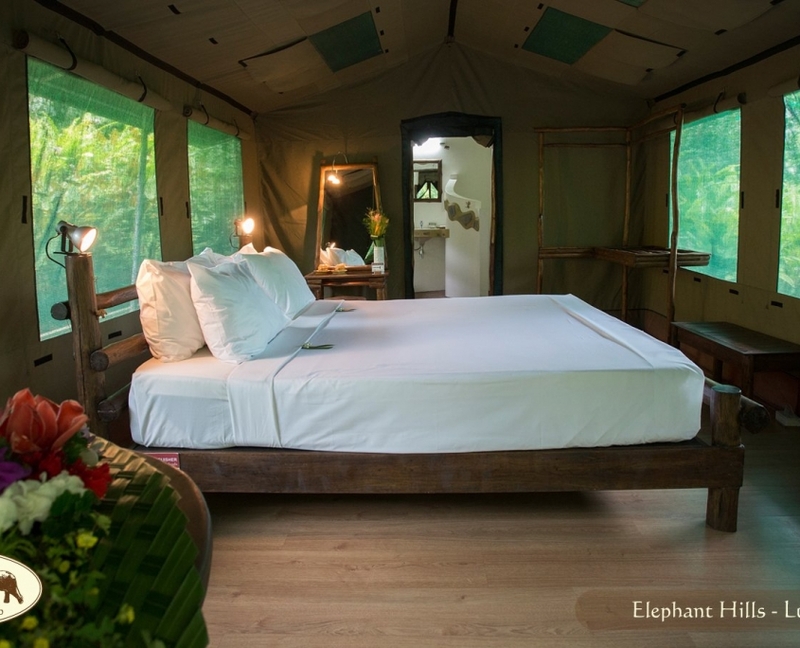 Due to its popularity, thousands of Glamping parks have opened around the world – with Elephant Hills being the very first Luxury Tented Camp in Thailand. As we built our first tents in the beginning of this century, the term Glamping had yet to be coined. 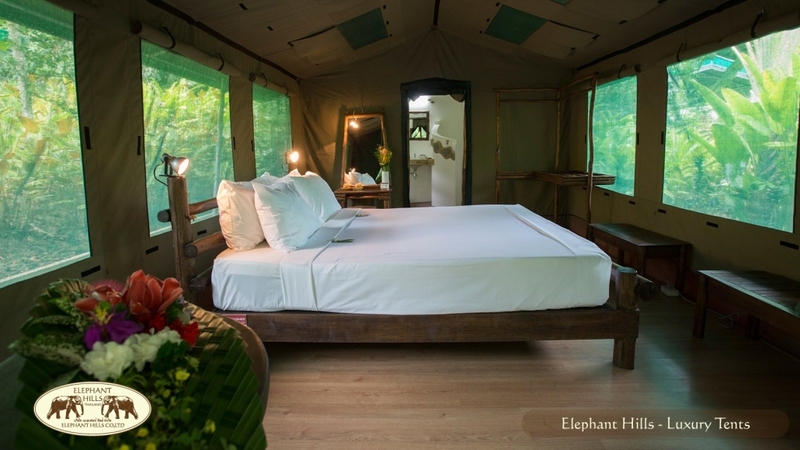 However, we knew that combining the camp concept of African-style safari tents with the unique environment of Khao Sok and its lush, evergreen tropical rain forest would be an idea to delight many a traveler from all over the world and in any age group. 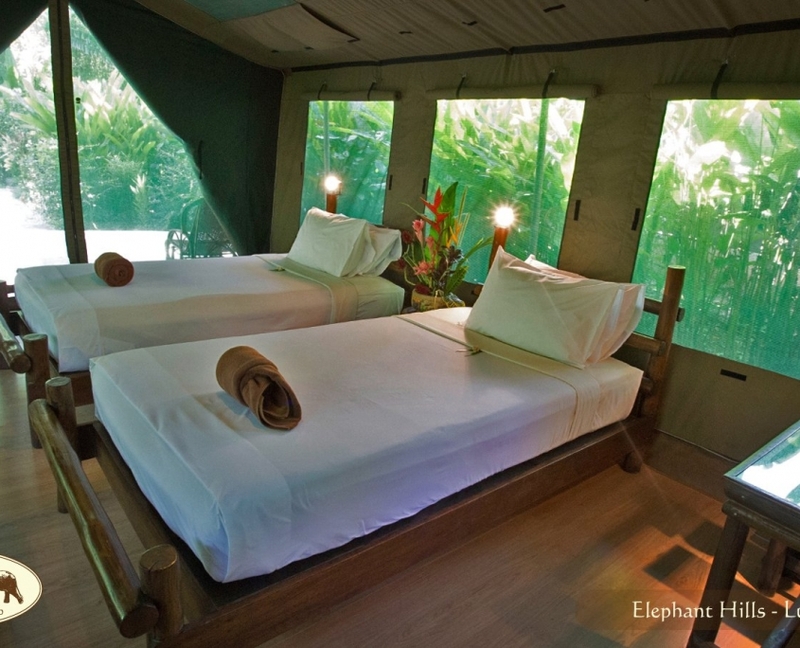 Elephant Hills comprises two Luxury Tented Camps: The Elephant Camp and Rainforest Camp. 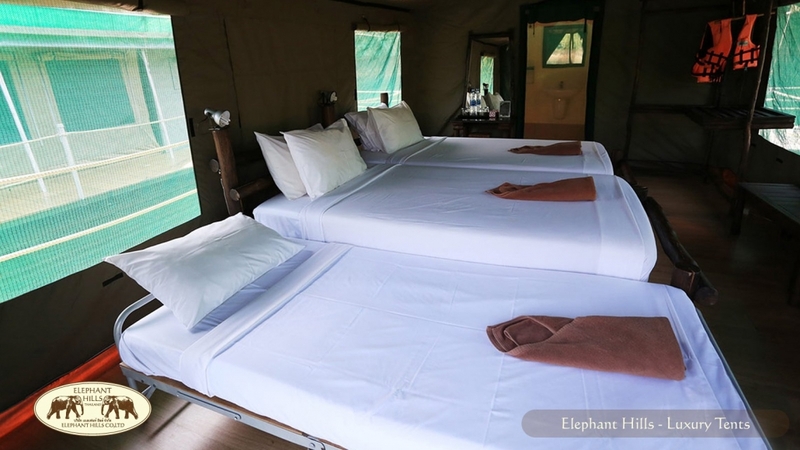 While the setting and the activities on the schedule of both are entirely different (hence we created the Jungle Lake Safari for you, a tour package combining both camps into one unique soft-adventure), the standard of the tents is equally high in both camps. 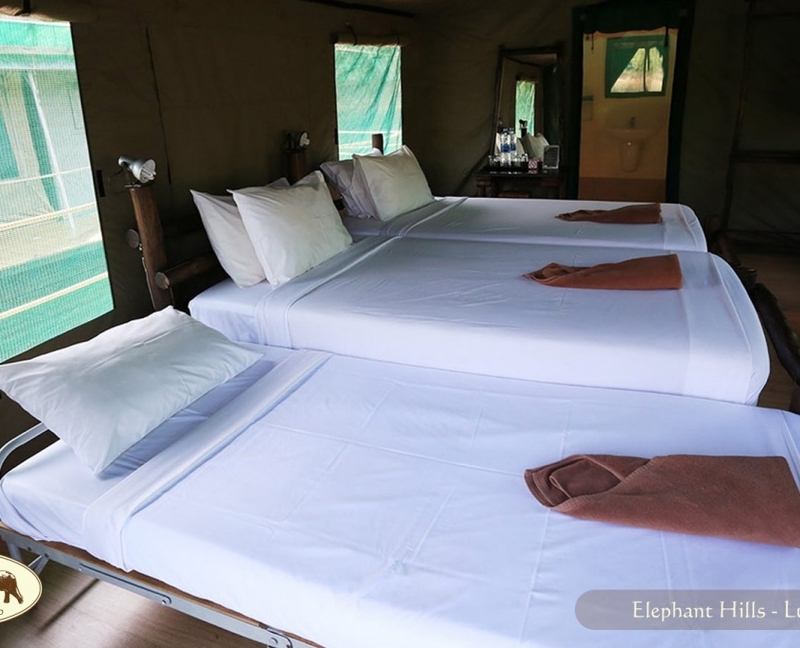 All tents are equipped with proper, comfortable beds, wooden floors, electricity as well as an en-suite bathroom. 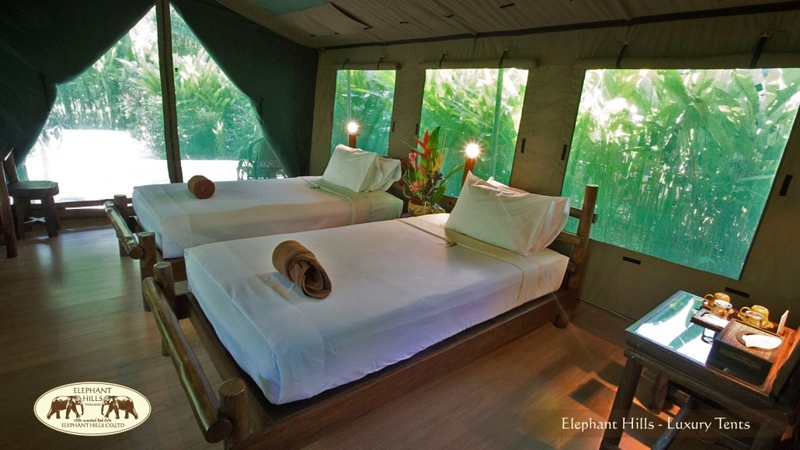 (Note: Electricity at Rainforest Camp might be limited at times, since the camp is powered by solar and wind energy.) At either location all that separates you from the superb nature around you are mosquito nets, which ensure the entire tent is bug- and insect-proof – but all the fascinating sounds from your fascinating surroundings will sing you to sleep (yes, we mean you, Asian toads & cicadas) as well as wake you up in the morning (listen out for those tantalizing whooping gibbon calls). 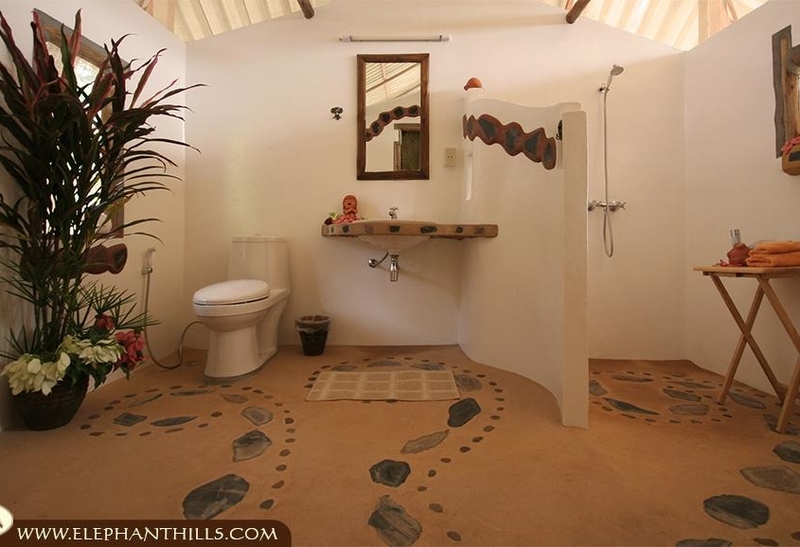 All bathrooms come with all amenities you might expect from a normal hotel room: Hot and cold water shower, western-style toilets, and Elephant Hills shampoo collection, and, at The Elephant Camp, they even include a hairdryer for you. Yes, you will certainly not be roughing it during your stay in Khao Sok. All furniture is crafted by our own, skilled craftsmen, and often all the small little details earn much praise by our valued guests. Or have you seen a light switch in the shape of an elephant before? Our tents are all of the same size and standard. The only thing you might want to think about is the bed configuration – most likely depending on who you are traveling with. But don’t worry, we have the perfect solutions for honeymooners and couples, single travelers, friends staying together or even for a whole family on tour. Take a look at the possible bed configurations below, then choose the perfect tour package for you, book a plane ticket – and off you go! What are you waiting for? This is the standard room configuration with one big, king sized bed. 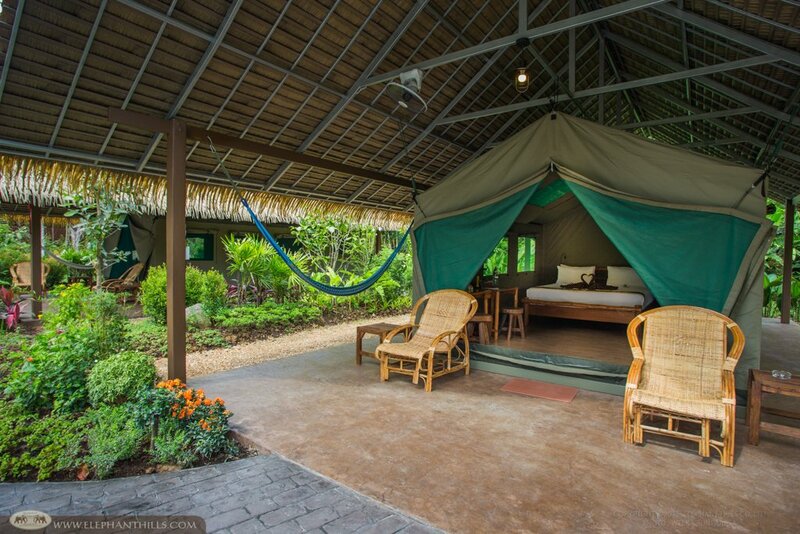 It is the ideal configuration for either single travelers (you’ll have the whole tent for yourself) or couples. Twin tents come with two separate beds, making them ideal for two friends on tour. Add a roll-in bed to a twin tent, and you have the perfect solution for three persons (can be three adults) who prefer not to share one bed with one another. When traveling as a family of four, we suggest the following: If one of your children is younger than 8 years, we suggest having this kid share a king bed with the parents. The second child sleeps in a roll-in bed, hence the whole family can be accommodated in one single tent, and the children can profit from our amazing kids discounts. In case both of your children are 8 years or older, we are happy to provide you with two separate tents – and you can still profit from our amazing kids discounts! Should you travel with a family larger than four (up to six persons maximum), we will accommodate you in two separate tents automatically.